This week on the Elite Advisor Blueprint, Kevin Lavelle takes us through his incredible journey of building and scaling a business from the ground up. Kevin is an entrepreneur and business executive. He is the founder and CEO of Mizzen+Main, which is a men’s clothing brand focusing on performance fabric dress shirts. He was named to the 40 Under 40 list by Dallas Business Journal in 2013 and was also named to Men’s Fitness list of Game Changers in 2014. Kevin was repeatedly laughed out of the room when pitching his idea to create a dress shirt that would not only look great, but would feel great too! After being rejected over and over and being told nobody would want to buy what he was selling, he decided to go out on his own, push the fabric boundaries and carve out an entirely new clothing category. Despite what the traditional menswear big shots said, Kevin knew what the market wanted and made it his mission to turn his dream into a reality. The company has since skyrocketed, being sported by people all around the world, including many super athletes and online influencers. If you’re a financial advisor who has never shopped at Mizzen + Main before and are used to wearing stuffy suits all day long, you need hit the pause button right now and go make an order. Trust me, you’ll thank me later when you’re wearing the most comfortable shirt in the world! We get into how Kevin’s idea as a 19 yr old intern on capitol hill led to him founding a company that changed the game in men’s fashion by creating a product that didn’t even exist before 2012. Next the conversation goes to how, as Kevin says it “being dumb enough to ask the wrong questions and ignoring traditional industry standards” was actually an advantage that led him to thinking differently about the fashion industry and creating a product his customers actually wanted to buy. Then we hit on the challenges of scaling a company that’s outgrown 6 offices in 5 years and the lessons learned along the way. Finally, don’t miss the marketing lesson Kevin learned from taking a leap of faith by cutting his biggest check ever to advertise on Tim Ferriss’s podcast and the INSANE GROWTH that followed and changed the trajectory of Mizzen & Main. [05:30] Kevin explains the origin of his company name, Mizzen + Main. [06:30] The “ah-ha” moment that led Kevin to push the fabric boundaries, overcome the traditional naysayers, and create the most comfortable dress shirt in the world! [09:39] When asking all the “wrong questions” can actually be a huge advantage for new startups. Find out some of the questions that Kevin asked early on that pushed preconceived notions to the curb and gave him a competitive edge! [18:21] Kevin breaks down the critical steps to quitting his corporate job, building a prototype, and leaping into the world of entrepreneurship. [19:38] How does a solo entrepreneur scale from 1 to 21 employees, grow out of 6 offices, and get into 300+ retail stores in only 5 years? Kevin explains the big touchpoints for making it all happen! [27:23] Kevin reveals the 3 biggest lessons he learned when it comes to scaling a company, including one of the BIGGEST pain points for Financial Advisors… Knowing how and when to hire A players! [28:50] Find out how Kevin hit a homerun sponsorship deal with the one and only, Tim Ferriss, and how it paid for itself entirely within the first 5 days of the ad airing. TIP: Don’t fall victim to thinking that any known influencer with a big audience will be a good fit for your brand. Kevin explains exactly what made Tim’s show the perfect match! [36:20] As Kevin puts it, his mention on the Tim Ferriss Show resulted in having to “drink from the fire hose for a couple of weeks.” How was a small company able to manage the INSANE amount of traffic? And you’ll also hear his brilliant tactic for turning his short term sponsorship deal into a neverending reason for Tim to talk about his brand. [41:10] What can financial advisors learn about incorporating podcast and Facebook advertising into their marketing mix. Kevin shares his best practices and lessons he’s learned. [47:20] Find out the simple secret to Kevin’s success when it came to landing big deals with major companies and super athletes and influencers like JJ Watts, Marcus Luttrell, and Kelly Starrett. [54:19] How financial advisors can stay ahead of the curve, differentiate themselves, and build an unstoppable brand. HINT: If you do things right, you’ll never have to worry about what the competition is doing! [01:01:19] The 2 people Kevin thinks of when he hears the word successful. [01:02:11] Discover the 2 entrepreneurial traits that were instilled in Kevin as a kid that he attributes to the success of Mizzen + Main. [01:03:27] Kevin shares his most gifted book. [01:04:37] The power of overwhelming optimism and how to overcome difficult moments during your entrepreneurial journey. [00:00:38] Brad: In this episode, I talk with Kevin Lavelle, the founder and CEO of Mizzen+Main, a men’s clothing brand that literally created a brand-new category in men’s fashion, performance fabric dress shirts. For those unfamiliar, think Under Armour meets Brooks Brothers for button-downs. On the personal front, Kevin’s been named to the 40 Under 40 list by the Dallas Business Journal and was also recently named to the Men’s Fitness list of game changers. Here are just a few highlights from our conversation. We get into how Kevin’s ideas, a 19-year-old intern on Capitol Hill, led to him founding a company that changed the game in men’s fashion by creating a product that didn’t even exist before 2012. Next, the conversation goes to how, as Kevin says it, being dumb enough to ask the wrong questions and ignoring traditional industry standards was actually an advantage that led to him thinking differently about the fashion industry and creating a product his customers actually wanted to buy. Then we hit on the challenges of scaling a company that’s out to earn six offices in five years and the lessons learned along the way. Finally, don’t miss the marketing lesson Kevin learned from taking a leap of faith by cutting his biggest check ever to advertise on Tim Ferriss’ podcast and the insane growth that followed and changed the trajectory of Mizzen+Main. Now before we get to the conversation, I’m incredibly excited to announce that Kevin in conjunction with my buddy Phil Randazzo over at American Dream U have partnered together to create a serious win-win for all you Blueprint listeners out there. 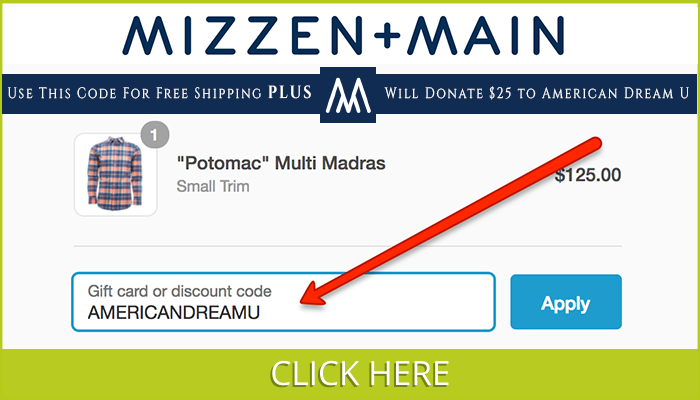 For every purchase made at Mizzen+Main utilizing the coupon code, AmericanDreamU, that’s no spaces and with the letter U at the end, not the word, you’ll not only have the opportunity to upgrade your wardrobe but also to serve a greater cause at the same time because you’ll get both free shipping on all orders as well as donate $25 to American Dream U for every purchase. For those unfamiliar with American Dream U, they’re a nonprofit whose mission is to help American veterans transition back into the workforce after serving our country. [00:02:32] Brad: So, if you’re intrigued by the idea of a performance dress shirt that actually feels good to wear, now is the time to check it out as you’ll serve a greater cause as well. We’ve made it easy in the show notes at BradleyJohnson.com/22. Just click the Mizzen+Main icon at the top of the post and make sure to use the coupon code, AmericanDreamU, no spaces, letter U at the end and as always show notes with links to books mentioned, people discussed as well as a complete transcript of the show are available at BradleyJohnson.com/22 as well. Thanks for listening and without further day, my conversation with Mizzen+Main’s Kevin Lavelle. [00:03:13] Brad: Welcome, everyone, to this episode of the Elite Advisor Blueprint podcast. I’m excited to have Kevin Lavelle of Mizzen+Main fame joining us here today. Welcome to the show, Kevin. [00:03:24] Kevin: Thanks. I’m not sure what fame that is at this point but glad to be here. [00:03:28] Brad: Well, hey, I can say that at least for my listeners or my viewers about every single episode that I’ve ever done I’ve been wearing a Mizzen+Main shirt so worst case scenario, very small amount of fame up to this point. [00:03:39] Kevin: Excellent. Love it. Love it. [00:03:41] Brad: So, for I just wanted to start at the front end of this. I’m very familiar with your company, what you guys have done, facts and stuff, being founded in 2012. But on the frontend, I just want to for those financial advisors that aren’t out there, I’m going to give you guys an unpaid endorsement, Kevin. Your shirts changed my life. I think back to the early days of when I was a football player back in college and it was kind of like the days before Under Armour ever existed where you used to have these cotton t-shirts that you wore around everywhere. That’s really where dress shirts were before 2012 and you changed that game. So, my early plug is if you’re a listener out there, you’re a financial advisor having to wear a stuffy suit around all day long and you’ve never heard of Mizzen+Main and you don’t have one in your closet, you need to literally hit the pause button right now and run out and buy one. So, I wanted to start with that because I know we’re going to change minds here regardless of what we cover, Kevin. [00:04:35] Kevin: I appreciate that very much. Thank you. [00:04:37] Brad: Yeah. And one other thing here at the frontend and we’ll get into this a little bit, Kevin, because I want to dig into it but you’ve done something really cool. My buddy over at American Dream U, Phil, you collaborated with him and every single person that puts in the AmericanDreamU code on the website when they buy Mizzen+Main not only are they going to get free shipping but you’re going to donate $25 to charity, to Phil’s charity, American Dream U, which supports veterans and helps them transition into the workforce. [00:05:04] Brad: You haven’t even hardly said a word and you’re already crushing it on the podcast today. [00:05:08] Kevin: This is my favorite podcast I’ve ever done. There we go. We’ll just call it a wrap. How can it get any better from here? [00:05:14] Brad: So, let’s dig into the show today. So, we’re going to get into a little bit of how you’ve scaled very quickly, how you’ve basically created a new, really a new fashion. I don’t even know what you call it. It’s almost like a new version of fashion in business dress but I’ve got to ask you at the front-end, where did the name Mizzen+Main come from? [00:06:26] Brad: Very cool. And so really a new category is the word I was looking for earlier. Performance men’s wear is really what you call it. I was doing a little bit of research here for the show. You have a very cool story back as a 19-year-old in 2005 where kind of this whole concept came from. Can you share that with the audience here today? So, I spent about a year in product development. I was joking with someone earlier today that I was dumb enough to ask all the wrong questions which turned out to be a lot of the right questions. I just didn’t approach it from a traditional industry perspective and that’s where I think we were able to push things forward. So, the response has been obviously overwhelmingly positive with the growth that we’ve had, exciting for us. We just got into Nordstrom this year and we are rolling out very rapidly with them. We had a two-door test in February and it went so well that they rolled us out to another nine in March and we’re going to continue that rollout over the course of the year. And that’s something five years in or almost 5 years in, it’s been a really extraordinary validation of the business that we built and the fact that when it comes to this new category a couple of years ago people were kind of laughing us out of the building that performance synthetic fabrics in traditional menswear, who would ever want to wear that? It turns out hundreds of thousands of guys want to wear that and probably millions once they actually hear about the product category. [00:08:32] Kevin: And now almost every brand in the traditional menswear world is starting to incorporate some level of synthetic even if it’s only a couple of percentage points in very traditional garments because guys want fabrics that breathe, fabrics that stretch, that you don’t have to iron or dry clean and waste the time and money to deal with that headache. And then for guys that travel and have to be presentable to not look like a disheveled mess when you get off your flight to go meet with clients or to go meet with your team after you’ve been out on the road and one of the early feedback I heard was guys want that starched cotton look. That’s great and that starched cotton look last for about five minutes in the morning before you get in the car or you get in the Metro or you get on the bus, whatever it might be, it doesn’t last long. And our shirts when you put them on in the morning, they look the exact same that night but it just also happens to be the most comfortable dress shirt in the world. [00:09:22] Brad: Hey. I’ve got a new marketing angle for you that just made me think of. You forgot when my one-year-old spits up on my shoulder, it’s much easier to just take a washcloth since it’s kind of the moisture licking material. So, you’ve got that corner of the market covered as well. [00:09:37] Kevin: Working on it. I like that. [00:09:39] Brad: So, you hit a few things there. What’s interesting I want to go back to is you said you asked all the wrong questions early on and what made me think of I actually had Joe Duran who’s a massive RIA and massive asset manager, he’s going to be coming up but I was listening to an interview with him and he says, “In business, a lot of the mistakes that are made is because people ask business questions when they’re starting to build a company as opposed to client-centric questions.” And so, I’d love to go back, what were some of the questions that you’re asking and how they hunched that it had a lot to do with what clients actually want as opposed to what businesses want to produce from a shirt’s perspective? [00:10:17] Kevin: Yeah. I think this is a little bit misattributed. I don’t think Henry Ford ever said this, people say that he did, “If I’d ask customers what they want, they would have said faster horses.” I’m not comparing myself in any capacity to that level of innovation and changing the world in the way that he did but everyone in the industry thought you couldn’t use synthetics because polyesters had a bad name from the 70s and that guys only wanted that traditional starched cotton look. And the most fundamental question was, well, why don’t you try? Why don’t you see if this is better? And that led down to a series of other questions which is, well, what are the different variations that you can use? The notion of synthetics it’s like saying food. It’s there are thousands, hundreds of thousands, you’ve got millions of variations. It’s no secret. You can look in our care tag, this fabric that makes up our most popular dress shirt category, the Leeward dress shirt, is 85% polyester 15% spandex. We’ve worked with a couple of dozen mills and looked at all of their varieties of 85-15 blends and they’re not the same. It’s very hard to replicate a fabric. So, the notion of synthetics not being in traditional menswear, well what if it was a 98% cotton, 2% poly? Started going down that route and then 100% synthetic and all the different variations. I went through hundreds and hundreds of swatches when I got started and eventually found one that as I draped it over my body you walk in and you say, “Does this look like a normal fabric?” And the answer is, “No. That looks like a synthetic.” You don’t want it to look shiny. You don’t want it to look like the negative perceptions. So, you just kind of keep going and you keep saying, “Why can’t I find something that’s softer or more firm or more structured or less structured?” That process, you just need to keep pushing forward and there’s someone who said, “Ask why five times.” I think that’s an old production kind of maxim to always make sure that you’re doing things as they should be. [00:12:17] Kevin: It wasn’t an existential question for me. I knew that I could find a way to make it work once we have that first dress shirt, that first prototype back in 2011. And then it was showing up at a tradeshow and having no idea how that works but just starting to talk to vendors who would carry our products and I got, as I said, almost laughed out of the room and some of the guys that’s saying, “I know my customers will never buy this.” I remember one story in particular because of the guy – you see all the same people at the same trade shows every six months and I just remembered this one guy who’s impeccably dressed. He has a very, very well-known men’s store in the Midwest and he just said, “My customers will never buy that,” and I just kind of smiled and said, “Okay. Well yeah. See you next trade show.” And he didn’t really need to tell me that. Thank you for your feedback. And in January of this year, they wrote their first order on the most recent tradeshow. And it was just not being afraid to show up and push the preconceived notions aside, not being afraid to look foolish and that’s both asking questions and showing up in a nontraditional way. [00:13:23] Brad: I think there’s a massive lesson there to also you and your market. You’re a young active guy just like I am and the dress shirt market I felt like I was a 65-year-old man every time I put a dress shirt on and it’s funny because when you know your market its – I’m not going to say it’s easy because obviously, you went through many different iterations. [00:13:43] Brad: You at least knew what you were shooting for. Here’s the finish line that I’m trying for. Now it’s how do I get the right process to get that right product in their hand? So, obviously, we’re doing a show here for financial advisors and so besides being your target market, people that like to spend money on nice clothes and presenting themselves well, all of them are entrepreneurs and I think there’s a ton of entrepreneurial lessons. So, let’s go back to the beginning of the story. So you’re 19. You have the idea. You see a really sweaty guy like a man who probably could have a better option for a dress shirt and then from my understanding, you went really kind of the corporate route. You were doing a lot of traveling overseas and you kind of put this dream on hold. Can you work through what was the mental process that you went through? When was the timing right to quit I’m sure a good job you were doing well at and start from scratch as an entrepreneur? Can you kind of go through the methodology or the steps that you took to take that leap? [00:14:35] Kevin: Yeah. Well, there’s definitely never a right time to quit a good corporate job and risk it all but the process for me was I wouldn’t say that I had a dream of starting my own company in 19. I had this idea that I just could never shake and I had no idea where to start and, again, I was 19. I didn’t know anything about the very traditional aspects of manufacturing and design but also how to start my own company. I just – it wasn’t at 19 I said, “I will start a performance fabric shirting company someday,” and I think that’s probably a good thing because if I tried to start it earlier, I don’t necessarily think I would have the intellectual toolkit or the network to do so but I did go to corporate route. I worked in management and consulting which when you don’t know what you want to do, it’s a great way to go start a career and expose yourself to a lot of different industries and learn a lot from some very, very bright people. And so, I think the main lesson for my first couple of years of managing and consulting and then I worked in an energy investment group was learning as much as humanly possible from very bright people around me, the partners of consulting firm, the industry experts that we worked with, people at the companies that we were consulting for and then at the energy company, very, very, very bright people. And it’s not that I felt like I needed to absorb every lesson possible from the energy industry but more so how do these people approach problems, how do these people talk to customers, how do they talk to their supply chain, how do they motivate team members, how do they compensate people, how do they structure an organization. And I felt like those first kind of four to five years in my career I was just this sponge and took in everything that I could, again, not thinking I’m going to start my own company someday. Just I’m going to learn everything I possibly can. And what really changed the game for me was a professor of mine from school, we had stayed in touch. He was a very successful entrepreneur and he taught some classes as an adjunct just because he enjoyed that process. He reached out and he had an idea. [00:16:31] Kevin: I won’t go into all that but we talked about starting a company together and it really kind of lit this fire and passion within me to say, “You know what, I want to start a company,” and I didn’t know what company I wanted to start. We decided that wasn’t the right time and we moved on from that but I kept coming back to this idea that had just been percolating for years of why don’t you make a dress shirt out of performance fabrics? And eventually I said, “You know what, I’ve got to give this a shot,” and it wasn’t at that moment I decided, “If I don’t quit today, I’ll never get there,” because I think there are some misalignment of advice that if you want to go start a company, you got to quit because you’re always going to be distracted. I think you need to make sure that you have the right fundamental pieces in place before you go do so. Some people can take that a little too far and feel like it’s never the right time but I needed a prototype. I needed to understand how we were going to position ourselves. I needed to understand post-prototype what was our name going to be, what was our logo going to be like there were a lot of pieces that had to be put in place for my industry specifically. And then once some of those are in place, I actually went to my bosses and ended up saying, “I’m going to go start a company,” and usually when people leave – I worked for Hunt. When people leave Hunt, they go start a competing energy company and so they’re usually politely shown the door that day because they’re going to go be competitors and when I told them that it was a dress shirt company, I think they almost fell out of their chair because it was just not what they had expected to hear at all. And so we worked out a timeline for my departure and I made sure that I wrap everything up appropriately. The path for me from the time I said, “I need to give this a shot,” to the time that Mizzen+Main was launched, it was about 18 months and that was because there were things I knew that I needed to address an answer. It wasn’t that I needed to have a certain amount of money set aside or I needed a perfect business plan or I needed all the right investors and all the right contacts and the right distribution. I needed to check some boxes to know that this has a chance to exist. [00:18:32] Kevin: And then once that was there then things started to happen pretty rapidly and from the prototype to launch was about seven months and it was about almost a year of trying to figure out where do I source fabrics from? How do I even make a shirt? Who do I talk to? And this was before some of the resources that exist today in American manufacturing so there was a lot of phone calls, it was a lot of Internet research and not many fabric mills or manufacturers are SEO kind of optimized and you just type in American manufacturers and you get this list. And so, there’s a lot of cold calling and talking to people who either I didn’t know how to talk to. This again comes back to asking the wrong questions. Some of them even though they’re American manufacturers didn’t really speak English and so kind of cross some of those hurdles but ultimately launched in July of 2012 and we’ve just been on a roller coaster since then. [00:19:24] Brad: So, let’s speak to the scaling because you guys – one thing that I’ve been very impressed and I’m going to want to get into some of your marketing stuff you do a little later on because I feel like you have this really cool kind of underground angle going even though you’re not really underground anymore but let’s speak to scaling first because that’s a big challenge for a lot of listeners is how do I build a team successfully? We’re dealing with the top-performing financial advisors in the country so I’m sure there are some pain points that overlap here. So, can you speak to 2012 founded? Literally right before we went live here, you just moved into a 14,000-foot new office from 4,000 feet so obviously massive growth there that I’m sure you’re probably going to outgrow that one pretty quick too. So, what have you got to plan after this one going? [00:20:09] Brad: Can you just, I guess, give us a little timeline? From 2012 basically being an idea and having a shirt, a prototype, what did that look like as far as growth, as far as employees, revenue and things like that? [00:20:21] Kevin: Yeah. So, one thing we don’t disclose our financials just from a confidentiality perspective but there’s plenty of other kind of points that I can hit. Really for the first two, two-and-a-half years it was kind of a solo ship. I had some folks that worked part-time with me from the outside and try to help us get off the ground but packed and shipped every box out of our house when I would travel for business meetings. My wife would have to come home and pack and ship in my absence. They included a handwritten note in every box. We learned a lot of lessons about customer service and connecting with people when you do that. And for the first three, three-and-a-half, four years, we grew at about 4X every year and that was both exciting and excruciating without kind of a full team around and we didn’t really raise money for quite a while and then it was just kind of friends and family money and then we – until most recently, we’ve not had any institutional capital invested into Mizzen+Main. Actually, I’m not sure when this is going to go live but very shortly we’ll be announcing our first major institutional capital raise that just came in. But at the beginning, we couldn’t afford to hire anyone because we were putting every dollar we had into buying more product. We didn’t have a marketing budget. We didn’t spend anything for the first several years on marketing. It was just working with social media and trying to meet people wherever I could. I went to things like that Dallas Marathon and a bike race instead of the expos because I thought these athletes love a performance fabric dress shirt and it was met with almost as much skepticism at the Dallas Marathon as it was at the traditional men’s trade shows. They were like, “Why are you selling dress shirts here?” and like, “Well you know the synthetics and the performance and this is exactly what you’d like,” and they just could not wrap their mind around buying a dress shirt at a Marathon Expo but I would do anything I could to get in front of people. So, we hired our first employee three years ago in April, May of 2014 and then hired a couple more, a couple more. [00:23:38] Brad: Probably sold some shirts for you. [00:23:40] Kevin: He sold a lot and it was awesome. Some woman actually bought a shirt just to have him sign it and that was probably the most expensive thing that’s ever been signed. Usually, it’s a football or a jersey. So, those are some kind of the touch points and if you count living out of our home and packing and shipping there as an office, this is our sixth office in five years. [00:24:03] Brad: So, let’s speak to some of the challenges of scaling. If you go back the last five years approximately, what’s the lesson you take away that you’re like, “Man, if I could do that different, I would’ve done it differently?” Well I’m guessing you might have one or two, right? So, I think I would’ve hired a little bit sooner. Everyone says hire slowly, fire quickly and I think that is usually said by people who don’t do the hiring and firing every day anymore. I think it’s people that they’ve hired and fired hundreds of thousands of people over the course of their career. When you’re very early on, you need some help. You need some people on your team. So, one would be hire a little sooner. Another would be, understand that especially as an entrepreneur, you are always the most optimistic person in the room. You think it’s going to take four weeks and $10,000 and it’s going to take eight weeks and $20,000 but you think that it will get done. I think a great example of that is Elon Musk kind of making announcements on stage that they’ll hit this target by this time and you can see the panic look from his staff and team members in the room like, “That’s not physically possible.” That goes back to Steve Jobs reality distortion field that he would just be so optimistic and just push people so much further than they ever thought possible. [00:26:16] Kevin: But there are some repercussions to that. There are missed deadlines. There are things that go wrong and people have to scramble, people have to pick up where mistakes were made because of pushing too hard. I think those would be two of the biggest ones. Another I think that it’s not a huge mistake that I’ve made. I think it’s more I’ve been open to asking the wrong questions and maybe looking foolish. Asking people for advice from who have done it before whether they’re your investors, your partners, mentors, friends, you’d be surprised how much great advice is out there. Don’t be afraid to ask for it and sometimes I was a little bit reticent to go out and see what information I could get. But mostly, I think I’ve just been so comfortable with the uncomfortable for so long that I’m fine to just ask the dumb questions, maybe look like I don’t quite know what I’m doing because I’m a former management consultant engineering student who started a men’s clothing line. I’m not claiming to be an expert. It’s okay to be wrong and then it’s okay to not necessarily look like you know what you’re doing all the time. [00:27:21] Brad: That’s awesome advice. You made me think as you’re talking through hiring sooner that very common pain points in financial services and I’ll never forget the quote that I heard in a mastermind one time that an A player is always free. And as long as you’re hiring high-caliber people, just going back to when I think you said you had 2,500 unread emails or something which I think we can all relate to that a little bit. But you look at the hourly wage to get somebody to take that off your plate where you as the CEO and the founder is making big-time moves that are going to open up opportunities like Nordstrom. You’re never going to get to those if you’re sitting there hacking out emails all day long. [00:28:02] Brad: I’ll never forget the A players are always free because they free your time up to go do the big things that your hourly wage actually deserves to be doing. [00:28:10] Kevin: I will also say and I get it when you’re not making any money and you’re putting everything you have into getting something off the ground, it’s tough to write someone else a check but know that your time needs to be – it’s not that your time is more valuable. Your time needs to be on the most productive things that you can be doing and at first, yes, and for a while, you need to be janitor, customer service, financial expert. You need to do the product. You need to do the planning, all of those things, but at a certain point, you should not be doing most things because you should be doing things that you are best at to add the most value to your business. [00:28:49] Brad: No doubt. No doubt. So, let’s go into your marketing because if there’s one thing that all financial advisors when I say marketing like, all of a sudden, they just turn the volume up. So, you’ve done some really cool stuff and I was actually trying to think back. I think the first time I heard of Mizzen+Main was as a Tim Ferriss podcast promo on the frontend where Tim obviously does the reads so you’ve got that credibility. And he just does a really good job. He only endorses products that he really believes in. So, I’m curious because there are a few lessons I think we can take but how did that connection all come about or are you just connecting with Ferriss’ team and, “Hey, I want to pay you some money to promote Mizzen+Main,” or can you share a little bit of that story? [00:29:56] Brad: About what time or year was this? [00:29:58] Kevin: This was in late 2014. [00:30:02] Kevin: Time is blurring together for me at this point. [00:30:03] Brad: I get it. So, you always want to be careful when you ask people for those favors because it can be tough. You only get so many cards especially with a guy like Tim. How many people want to use Kelly to get to Tim. And so that direct connection was a validation for Tim that this was real. This wasn’t some fly by the night thing. Tim’s a very busy guy. He doesn’t have time to vet everything but Kelly and I had corresponded. We kind of knew each other and he liked the product. So, that was a big hurdle to clear in that process and we sent Tim the product and he actually called me. I will never forget getting a phone call from him especially as he’s someone who’s like never make phone calls, that’s your time. He’s little engaged as possible and I think he knew how small we were at the time and so he gave them the cost of the sponsorship, just wanted to be genuine and sincere and he’s a very nice guy. [00:32:03] Kevin: And basically said, “Look, if this is make or break money for you like if these are your last dollars, I don’t want your money. That said, if it’s not, I think that given how much I really like your product and my engagement with my listeners, I think this could be a homerun. I think we could really do big things for you guys.” So, I said, “All right. Let’s do it,” and wired him the money upfront for three episodes. It was more money than we spent on anything ever and we were sitting there. He did the read himself. He asked me for some talking points but he does his own reads and it’s his own voice and I think that’s part of why his ads are so powerful is people genuinely believed him because he’s not just selling himself all the time. So, he did the read. We weren’t sure when it was going to air and we were sitting there. It was like 9 o’clock in the morning and it was like at the time a good day we’d have maybe four or five sales by 9 AM and it was like ping, ping, ping-ping-ping, ping-ping and we couldn’t figure out what it was and it was right around the time that Mark Cuban wore one of our shirts in a television commercial. Not endorsing us in any capacity. He was just wearing one of our shirts in an ad and my wife and I looked at each other and said, “There’s no way that that’s from Mark’s ad,” like it just can’t be. And we were correct it was not from his ad. Tim’s first podcast had hit. So, within five days of the first podcast, all three podcast had been paid for including the cost of goods so like margin was covered and it just was an insane week. We were doing our fulfillment ourselves. Thankfully we were in a real office at this point and so we were just drowning and then the second podcast dropped and it was Tim interviewing Kelly Starrett in an episode called CrossFit, the Good, the Bad and the Ugly. And so, like just it wasn’t scandalous. He was just talking about like what are the ugly rumors? [00:34:01] Kevin: It wasn’t knocking it at all but like it just lit up and we did almost double the first podcast from one to two and so by the third one when we heard the third one, we were just jumping up and down because we knew we were going to probably sell out of everything. We almost did. I mean, 2015 was a rough year because anytime we would get product back in, we were already almost sold out of it because we were allowing back orders. We didn’t want people to walk away from the site and haven’t bought anything. That is one of those things where when people commented on our site or by customer service like, “Don’t you guys know what you’re doing? How can you always be sold out?” And I just wanted to pull my hair out because it was like, “Don’t you think I would’ve loved to have sold you something?” I mean no one can prepare for that type of growth from a product. You can’t just turn up a supply chain to crank out 10 times the amount of product in one month. But we learned plenty of things along the way. The main takeaway was Tim’s voice was so authentic to our natural demographic. We couldn’t have found a better matchup but that does not mean in any capacity that you can just find someone with a big voice and a broad audience that is going to connect with your audience. Like there are plenty of sports podcast that our customers maybe, maybe not listen to but they command a huge premium because they have a wide listenership but that doesn’t mean people are going to act on things that they hear. In fact, most of the time, you kind of tune out the portions with ads whereas with Tim’s customers he refreshes his ad content so often usually people are like, “I’m not only listening to the podcast to learn. I’m going to find out about something new that I haven’t heard of before and Tim endorses.” And people read his blogs and listens to his podcast to find out what he thinks and what he recommends so an ad is like a natural extension rather than a traditional ad. [00:36:19] Brad: It wasn’t me. I wasn’t holding it against you. So, let’s speak to what you learned there because I think there’s so much from a business standpoint. The marketing hit, there was homerun and what sort of, I guess, opposed to just sitting in a corner and crying because new people want to buy shirts and you can’t sell it to them, what did you proactively do to manage through that? How big was the team at the time? What sort of things were you doing? [00:36:45] Kevin: It was beginning of 2016 so I think there were six or seven of us, add six or seven somewhere around there. I’ll be honest and say there wasn’t anything at the very beginning where we’re like, “Okay. Now that we’re blowing up, this is what we need to do.” It was just drink from a firehose for a couple of weeks straight and how can we catch up this fast as possible? That was the kind of modus operandi if you will at the time. What we did to kind of capitalize on that and make sure that we could take advantage of the chaos was we set up landing pages specifically targeting Tim Ferriss’ listeners. We honed our website. We honed some of our social media. We honed some of our SEO. We honed some other elements of what we were doing from a marketing perspective to make sure that this homerun that we had hit carried forward further and further and further into the future and it wasn’t just like a press that hits and then drops again. Certainly, the power of his audience had an effect on that but also the decisions that we made to refine our message, to stay nimble, to be adept, to okay how can we go after Tim Ferriss’ listeners on multiple different platforms without Tim specifically endorsing us? Again, in another capacity, how can we carry this forward? So, we made a lot of changes in our overall marketing strategy. And then the other thing and it’s no secret that this article is out there and it’s no secret why I wrote it. I have done a lot of writing about my experience over the last several years in both blog and Medium.com just to share some experiences and also use it as a platform to kind of tell them as the main story. In the two or three weeks afterward, I wrote a blog called The Tim Ferriss Effect – Podcast Edition. [00:38:41] Kevin: Because in making my decision to pull the trigger on sponsoring Tim’s podcast, I read a – it’s like a Forbes.com or some article that said, “The Tim Ferriss effect” and it was a writer that said, “If you were trying to get your book up the readership list, would you rather have like a New York Times editorial, a CNN evening cover story or evening news story or some random guy who talks about kettlebells and weird fetishes post on his blog?” And he said the Amazon instant rank that he watched, he was like 1,132 and then when CNN hit he went up to 1,100 but when Tim hit he went from 1,100 to like 312. And so, I wrote a story on Medium describing with a lot of, well not specific numbers, a lot of percentages on returns, a return on ad spend and daily traffic, sales volumes detailing that experience and it was titled The Tim Ferriss Effect — Podcast Edition. So, Tim over the last three years, two-and-a-half years has shared that post a number of times. I’ll share it and he might retweet it so on and so forth because the question is, does podcast advertising work? And here I can tell you with concrete examples it’s one of the best decisions we’ve ever made. So, there’s been a way for our sponsorship which took place over the course of 2015 to live on and for Tim to have a reason to continue to talk about us. We’re looking at doing some additional ad partnerships in 2017 with him again. But more power to him, his ads have just gotten too expensive for us from a direct return perspective because with how we’ve grown as business we have to really direct return every dollar back in and at this point in time it’s not that every Tim Ferriss’ listener knows about us but over the course of the year’s’ worth of ad spend, it’s not going to be as explosive as it was for us initially. So, we haven’t been able to sponsor anymore podcast in the last year or two but he continues to share our story as a great success story and so I think giving him a reason to continue to have us be present in his world has been very, very potent. [00:40:59] Brad: So, when your shirts go up to $300, $400 apiece, I can just thank Tim Ferriss. Just go ahead and give him that ad spend, right? [00:41:07] Brad: So, let’s go to – there are a couple of things I want to hit on. Besides the podcast stuff which I think is very cool how you went that route, you are maximizing the small amount of spend dollars you have from a marketing perspective at the time and obviously, the results speak for themselves. I also and probably this is because you’ve got my cookies that you’re tracking on my web browser or whatever, every time I’m on Facebook there’s literally a picture of J. J. Watt and a Mizzen+Main popping up in my ad stream. So, can you speak to a little bit of your philosophy there? And to bring this full circle from a financial advisor standpoint, podcast and Facebook ads are kind of uncharted territory. And so, can you speak to maybe some learnings on Facebook and what you guys have done right and maybe what you guys have done wrong there? [00:41:54] Kevin: Yeah. I think the good news for us is we really haven’t had that many misses with Facebook so I think it’s more some positive takeaways which would be you can blow a fortune on Facebook ads but if you start small and look at continuous optimization for what’s working, you can get in very refined ad spend and track very specifically and not all that complicated how well each dollar that you’re doing in that medium is working. And I think that’s part of why they’ve been so successful as a business is because it is so directly trackable in terms of what’s happening from an impression and a click through and a conversion rate whereas there really has been nothing this granular before from both a targeting perspective. Because in traditional display advertising, you just kind of say, “Here’s the general bucket we’re going for,” but with Facebook, you can get so specific and then you can get such great information back on who’s actually buying in terms of your ad dollars. So, I think it’s just really important. You may say, “You know what, I can afford to spend $5,000 a month and I’m going to spend $4,000 of that on Facebook and $1,000 of that on podcast, and just see what happens. You can just light that money on fire. But if you really hone in to your very specific audience which Facebook gives you those tools and then say, “You know what, if my goal is $5,000, I’m going to start out spending $500 to $1000 and then I’m going to tweak three different ad sets and I’m going to see which of those works best. Well, I’m going to try three different ad sets across three different target demographics.” And then now you’ve got these variables that you can tweak. That level of play has just worked really well for us to say what’s working. So, we started at that where we were literally spending $500 a month to an hour spending many, many, many times that to make sure that those dollars are converting to sales. [00:44:46] Brad: So, Kevin, real quick because I have an IT background. I kind of nerd out on this stuff a little bit but my guess is a lot of our listeners don’t. So, can you break down retargeting, what that actually means? So, if you’ve been to our site or if you bought something from us, we’re going to try and present advertising in a very different way than someone who’s never heard of us and doesn’t even know what we are in general as a company. So, that level of specificity and granularity does not happen right out of the gate and quite frankly, it’s okay if you don’t know how any of that works. What I’ve just described to you is almost the extent of my technical knowledge because, again, that’s not what I should be spending my time on. I’ve got some really great marketing people on our team, the best being my wife who’s our CMO, but we also have worked with great partners along the way who both teach us what we need to know and go and execute it. Sometimes we’ve got to pay experts for what you don’t know what to do. And being a financial planner, that’s a big part of what you guys sell is we are going to be able to do this better than you can do it yourself and so working with advertising partners along the way has been very valuable. [00:46:42] Brad: Cool. Thanks for breaking that down. So, for you advisors out there that you go out, I see this all the time, Fisher Investments, Carson Wealth, those are retargeting ads. If you’ve hit their website, you’ll notice they just kind of follow you around. So, they definitely get used in our industry although it’s right now at this point it’s mainly the big players in the space. All right. Kevin, a couple of other questions then I want to get to the rapid fire because I know you’ve got a new office space to break into. [00:47:07] Kevin: I’ll apologize for any background noise that your listeners might hear. I don’t – this is one part of one wall. Right next to me is an unfinished part of the wall to our broader office so apologies in advance for random things that you might be hearing in the background. [00:47:19] Brad: All good, man. So, I want to hit on this because somehow and I know you’ve got to have a secret to this. You’ve done a very good job connecting. I mean, you’re a young guy like me. You’re basically a little startup business and then you hop on Ferriss and things explode and you’ve continued to grow like crazy but somehow you connected with Kelly Starrett. So, for those that do CrossFit, he’s like the man as far as kind of really helped create what CrossFit is today. J. J. Watt, everybody knows that name, All-Pro for the Houston Texans. Marcus Luttrell, I saw you’ve also connected with him. We actually had him speak at one of our events. So, the Navy SEAL of Lone Survivor fame. Tim Ferriss as we mentioned earlier. You’ve got some various strategic connections with some guys that are big influencers, especially to your target clientele. How do you go about doing that? [00:48:07] Kevin: Some of it was a lot of luck. As you heard the Tim Ferriss things, some of it was good strategic decision-making and presentation and also just luck from a prior connection. I think the most important thing that I would say that I’ve done is just be very consistent in who we are as a brand and a company and how we treat people, and how we tell our story. So, that people have – if they hear about us from a friend who’s a celebrity or an athlete but hear about us from a friend, they want to be associated with us. It’s a positive thing. And then also in that notion of not being afraid to ask the wrong questions. It’s been very important for me to feel comfortable pushing the envelope a little bit in terms of putting myself in a situation that I might not have expected. We’ve done probably 50 Major League Baseball trunk shows where we’ll actually go in and set up a rolling rack. And there we are at the Washington National Stadium doing a trunk show and Bryce Harper walks up and buys a couple of shirts from us. I think some people might put themselves in that situation and just say, “Oh my God, Bryce, you’re such a great player. I love what you’re doing,” and for me, it was, “Hey, we’ve got these shirts. I think you’ll love them,” and just leave it at that. Let the product speak for itself and not maybe push things. I’m in an uncomfortable situation selling to some of those famous athletes in the world but just staying true to who I am and letting the product speak for itself and letting our values come through as well. We don’t take pictures of these guys unless we have an official deal together. We don’t ask them for anything and I think therefore the reputation spreads that these are good guys to have around whereas other people might take pictures or say, “Hey, can you tweet about me?” and these guys get asked for that stuff all the time and we never ask those things and so, therefore, I think the relationship starts to strengthen. [00:49:54] Kevin: J. J. specifically was a year-long kind of process in saying that we want an athlete of that caliber to be the face of the brand. And working slowly but diligently with his agent and kind of presenting the story and saying that this is a good decision for him and here are the reasons why but ultimately letting the product speaks for itself. It was months of conversations and then when he finally tried the shirt on for the first time he said, “Oh my gosh, I love this. I got to find a way to work with these guys.” Now athletes and agents and lawyers, the athlete can say, “I want to do it,” and the agents and lawyers take a long time just because of the nuance of those types of deals but that’s a long-winded answer. It’s been a lot of luck. Sometimes pushing the envelope and saying, “Let’s go ahead and start doing these trunk shows,” and then just staying true to who we are, not asking for things that we don’t feel are appropriate to ask for and making sure that ultimately the product is something that people really want and it’s easy for those types of guys to love. [00:50:54] Brad: Yeah. I think what’s interesting, you hit on something there, if you had a crappy shirt, none of this would matter. If you didn’t have an A+ product like J. J. Watt all you’ve got to do, let him try it on. Game over. All right? I mean for a guy that has to wear a dress shirt when he’s traveling or whatever, it’s the best thing out there. And so, I think even going back to the Bryce Harper story, what’s interesting about that is like financial services, bring value to your clients. That’s what it’s all about. If you can’t do that then none of the rest of the stuff matters. That’s exactly what you did. You wheeled in a rack of shirts, “Try it on. I think you’ll love it,” and go from there. You weren’t asking anything back and I think there’s such a lesson there. [00:51:38] Kevin: The other thing I’d say kind of hopping onto that thought process would be that the power of the quality of the product, as you just mentioned, but also referrals, people having positive things to say so in your world, clients referring their friends or not necessarily a direct referral but just speaking positively. If we didn’t deliver on the value, these guys wouldn’t be open to seeing us again or when they go to another team bringing us to their new team’s locker room or introducing us to other guys in the locker room and that comes from delivering that value and, as you said, the quality of the product. [00:52:11] Brad: So, I’m curious. How did you set up your first trunk show with the Major-League team? [00:52:15] Kevin: This was a big stroke of luck. One of the guys I went to high school with who we weren’t that great of friends in high school, we just didn’t know each other that well, he was one of the only guys who made it in the big leagues and he followed me and our company on Twitter on the same day and so I reached out. I hadn’t said anything to him about Mizzen+Main because I didn’t want to be that guy that we hadn’t spoken in years and now I’ve got a reason for something from him. And I said, “Hey, how’s it going?” And this is Ian Desmond who’s with the Rockies now and he said, “I love your product.” And at the time we truly were still packing and shipping everything out of our own house. I was like, “You know, I would’ve known if you bought a shirt. How did you get one?” And his wife’s mom bought him one for Christmas after seeing a story in our local hometown paper that we had done. So, he said, “You got to come to a trunk show,” so he got us up into the nationals’ locker room. We did like $10,000 in an hour which was more than we were doing in a day and then word just started to spread. Some guys told their friends about it or some guy got it on that team and then got traded somewhere else and so he went somewhere else and said, “Oh my gosh, what is this?” Some of the guys are asking about it and just started to snowball from there. [00:53:26] Brad: That’s funny. It’s very similar in financial services with a lot less athletic skill because it’s like one guy wears a Mizzen+Main shirt and then all of a sudden it’s like, “Well it’s just amazing. You should feel this thing,” and then the next thing you know there’s like a crowd of people around just stretching their shirt awkwardly. [00:53:49] Brad: For sure. So, one other thing I want to ask. So, in financial services, I’ll name drop here again, the name Jeff Rose, one of my good friends – you’re nodding like maybe you even know him. [00:53:59] Kevin: Just from Twitter so yeah. [00:54:00] Brad: Okay. There you go. So, Jeff’s a good friend and a client of mine and probably besides myself, your biggest raving fan as far as Mizzen+Main in our industry. And so, I hit him up. I texted him. I said, “Hey, do you have any questions for your boy, Kevin? He’s going to be on.” And so, he threw one at me so I’m going to throw it out there. So, you got State and Liberty out there, a competitor and one thing that’s interesting, they just started up so January 2015 and I’m going to say basically they probably saw a Mizzen+Main shirt and said, “Now that’s really cool. Let’s see if we could hop on this bandwagon too.” I don’t know if that’s all. [00:54:35] Kevin: They actually applied to work at Mizzen+Main before they started so, yes, I’m very familiar with them. [00:54:40] Brad: Okay. Well, there you go. That pretty much answers that question. So here’s my question though. Because this is going back financial services. People get worked up about their competition in their local market and it’s no different in any business. You’re going to have competitors, you’re going to have imitators, you’re going to have people that try to ride the wave. Strategically, and I don’t want you to share anything you’re not comfortable sharing but strategically as you see competitors and maybe I’m a Nike or an Under Armour and all of a sudden, I’m like, “Man, these guys are crushing it in dress shirts. Maybe I want to hop on that bandwagon.” How do you strategically start to think through here’s how we’re going to handle it, here’s how we’re going to differentiate and always be the top player on our space? [00:55:18] Kevin: Ultimately, it comes from not letting yourself get distracted by what other people are doing because what other people are doing if you let that guide your decision-making then you’re going to lose. What you need to focus on coming back to one of the things I talked about early on is what should you as the CEO or the founder, what you should be focused on and what are the most productive things that you can do to your time and your resources as a company to deliver the most value over the long-term? And I think that there are so many people that get caught up, as you said, with competition. We make performance fabric dress shirts. Now at this point in time, there are probably a dozen, two dozen people that do a similar thing that we’re doing it when we started and we’re doing it maybe even a year ago. What Mizzen+Main needs to do is deliver the best product you possibly can, the best customer service, the best distribution and availability and that will determine our fate and our future. [00:57:20] Kevin: So that said, Under Armour has taken a decidedly different approach to fashion and kind of menswear world and there are plenty of established brands that are kind of dabbling in it. It’s great. The more people that produce synthetic or performance menswear, the more customers are going to be aware that the product category exist because we’ve kind of created this product category out of nothing five years ago. The more that people, established players or other upstarts making noise in the space, the more that people are going to be aware of the product category and I am very confident that customers, when they hear about us, will know that we are the best performance menswear company out there and that we are the company that people not only love the products but people love us as a company and we’re going to continue to do things the right way, that people want to be associated with. We keep things made here in the US so we’re having an impact on jobs here at home. We give back to the veteran community. We hire and treat people internally at the company the right way. Those are all things that no competitor can touch us on and is a part of the bigger story that we’re telling here. So yeah, so many people are going to make other products that are directly competitive. I’m going to focus on how do I build the best possible product and the best possible company and the competition will sort itself out. [00:59:24] Kevin: Yeah. And let’s look at scale for a second. I think Nike has something like, I don’t know the exact number, it’s like 7% or 9% or 10% of the global athletic wear market. It is one of the most well-known brands in the world, one of the biggest brands in the world and they own less than double-digit percentage of the market. I’m not worried about competitors. There is so much opportunity out there. And then you look at what Nike had in terms of their dominance and control. Lululemon came in and their recent struggles aside, they were able to create their own space out of the general, the yoga and kind of mindful world that Nike still hasn’t been able to touch. Again, recent financial woes aside at Lululemon, they got nothing but growth potential still. So, I think if you let competition take up brain space, you are focusing on the wrong things. Now that said, don’t pretend that nothing else exists in the world. You need to generally understand your place in the market and what you’re doing and how the overall market is changing and you need to protect your business as well. So, if there’s IP theft, we’ve had five people that I’ve sent cease and desist to because their logos were basically direct copies of ours or very close to it. There are things that you need to do to protect your business and stand up for yourself but should you be worried about will a competitor take my market share then you’re thinking about the wrong thing. [01:00:49] Brad: For sure. Great advice there and it’s very common in financial services that a lot of people let competitors take up way too much headspace. When if they just focused on their business and growing it and building it like it needs to be built, it’d be time much better spent. So, great advice there. Thanks for sharing that. [01:01:07] Brad: All right, man. So, a la Tim Ferriss style since that was really where you guys jumped off into massive growth, we’ll do a little rapid fire question here to wrap if that works for you. [01:01:18] Brad: All right. When you hear the word successful, who’s the first person you think of and why? [01:01:23] Kevin: Probably the primacy and recency thing we were just talking about, Phil Knight. I read his book about a year ago now right when it came out. What he built against the odds at the time when building companies in that capacity were just so atypical. His negative controversies aside, I think that he’s probably the first person that comes to mind. And if I just take a step back and move away from the fact that we’re just talking about this, I’d also say probably Richard Branson just because he’s done so many different types of things and been so successful in so many different arenas. Those would be two people that immediately come to mind for me. [01:02:00] Brad: Out of curiosity, I find that most entrepreneurs didn’t just snap their fingers and become one. Were you one of those kids that grew up and you’re like selling baseball cards at a stand on the corner? Did you have many early entrepreneurial tendencies? [01:02:13] Kevin: I think the entrepreneurial tendencies I’ve displayed over my life were not I want to start a business or like how can I earn some extra money. It was more intellectual curiosity and my mom talks about that I used to just like peck her to death about like well, why not? Why not? Why not? Why not? Or why do I have to do this? Why do I have to do this? Why do I have to do this? That married with – it sounds so basic but I just remembered growing up, I would always ask my parents how to spell something and without fail it was, “Well, how do you think you spell it?” And so, they were always pushing me to be more, to think harder, to challenge myself. So, I think those two things were kind of my entrepreneurial tendency. It wasn’t about money. It wasn’t about success or having my face on something. It was more that sense of intellectual curiosity and really pushing for more that I think has been what has made Mizzen+Main as successful as it has been this early on that I walked into an industry I knew absolutely nothing about and was able to just kind of crack a code that no one else had. [01:03:18] Brad: You used that why, why, why, just like when you were a kid, man. [01:03:22] Brad: What’s your favorite book you’ve ever read? I’ll ask this in two parts to give you a little time to think on it. What’s your favorite book you’ve ever read and why or what’s your most gifted book that you hand out? [01:03:33] Kevin: Over the last year my most gifted book so therefore my most gifted book ever has been Shoe Dog. I’m giving it to a whole bunch of people. Really his story I see so many similar characteristics or traits in the early days of our respective companies to getting the – putting us in the same category of success. But a lot of the same struggles just really resonated with me when I read it and the fact that he also knew nothing about what he was doing so often. I just loved hearing the stories about his early team members and kind of the early wins. And also, in building a business how often you’re so close to just amazing success and also are we going to make it and that thought process going back and forth. So, that would be it. I love reading. I’m trying to read as much as I can and never nearly enough but Shoe Dog for me would be it. [01:04:28] Brad: Awesome. That’s literally at the top of my list. I haven’t cracked that one yet but I will shortly. Let’s go two more questions and I’ll let you get back to running a business here. Was there ever a moment you felt like giving up on this journey? [01:04:41] Kevin: Unequivocally no and that’s not being stoic. I just I’ve never thought about giving up and I’ve never thought – there had been moments where it’s like, man, I don’t know how we’re going to figure this out and it’s more I don’t know the mechanics of how we’re going to figure it out, not will we survive? That is an element of, as I described earlier, that overwhelming optimism and that perhaps naïve optimism of an entrepreneur but also, I just know we’re going to do it and so with that there have been plenty of very, very, very, very hard moments but never a question, why am I doing this or will we actually make it? [01:05:20] Brad: If you don’t mind sharing what was one of those hard moments, was there a hardest moment in there? [01:05:27] Kevin: The first person that I ever had to let go, that was not an existential will we make it as a company question but it’s easy to say hire slowly and fire quickly. It is an entirely different thing to look someone in the eye and say that, “You no longer have a job here.” It was just so crushing and it was completely deserved for a separation but it was really devastating to go through it. That would be one of the moments that stands out as one of the hardest times in running a company. Another has been in the fundraising process we’d only raise money from angels to date and, as I said, we’ll shortly announce our first institutional raise. Going through dozens and dozens and dozens of fundraising conversations and having very, very, very bright people look you in the eye and tell you they’re not going to invest because they think that you have no chance, not like, “No thanks. I’m not interested,” but laying into you that you have no chance of being successful, it’s very demoralizing. Also, very instructive that if people, I hope someday to actually have enough money to invest in something else other than just this company, but if people ever come pitch me for their business I think the most I would get is, “I just don’t think this is for me,” and if they ask for advice I think I would give them my candid feedback and say, “Look, only you know us much as you need to, to be successful. From my outside view, here are some things that I think you might want to show up or change,” but it’s very demoralizing how very bright people tell you that they’re confident that you will not make it. [01:06:59] Brad: And it has to be very motivating at the same time I would think for you. [01:07:03] Kevin: Yeah. There are a couple of conversations that I look forward to those people reading stories about us. [01:07:08] Brad: Well I have no doubt because I don’t have a finger on the pulse of your business like you do but I definitely know our industry and we’re working with some of the top independent financial advisors in the country, everybody that buys one of your shirts are repeat customers. So that’s a pretty good sign you guys are doing something right there. [01:07:28] Kevin: Here’s a – we don’t share financial statistics about the company other than this and eventually we may stop sharing this specific number as well but our top customers, our top 130 customers had spent half a million dollars with Mizzen+Main since its inception. So, we’re definitely doing something right and we’ve got amazing ambassadors and customers had spent quite a bit of money with us so I know we’re going to make it. I know we’re going to be fine but those conversations, as I was saying a moment ago, those were tough to endure and frustrating to have wasted my time. I think ultimately that’s what bothered me most about those was I just wish that I hadn’t bothered with that conversation. [01:08:03] Brad: Well you just answered my question, what I have to do to be a top 130 customer with you. I’ve got some work to do, man. [01:08:08] Kevin: There you go. [01:08:10] Brad: All right. So, Kevin, this has been awesome, man. I’m going to wrap with one final question here. And I guess preface to this knowing that our listenership, our financial advisors, very successful ones all across the US here, what is the one piece of advice you can share with our listeners that’s led to your success? [01:08:28] Kevin: This I hope it doesn’t come across as a stock answer because it’s the answer that I’ve given to this question and in various formats. Jim Carrey gave a quote years ago at a commencement speech and it was basically, I might not be getting it exactly right anymore, “You can fail at what you don’t love so you may as well give a try in what you do love.” It’s not that I love menswear so much that I just have to be the CEO of a menswear company but the act of building something and doing it in a way that I’m proud of every day in how we treat people, how we treat our customers, the decisions we make, the values we have, nothing other than being a father and getting married, nothing has ever been more fulfilling so I’ll say nothing professionally has ever been more fulfilling and I can’t imagine doing something else. Looking back five years ago, I definitely thought things were happening a lot faster and I thought that it would’ve been not nearly this difficult but I also know that I was not meant to do anything else other than build. So, this has been remarkably rewarding, very, very difficult but remarkably rewarding and I’m glad that I didn’t let fear of failure or, “I have no idea what I’m doing so I probably shouldn’t go into that industry,” I’m glad I didn’t let that dictate the decision as to whether or not just start this company. [01:09:43] Brad: Awesome. Well, Kevin, thanks so much first of all for carving out time. I know it’s hard to come by these days and sharing just your message and some incredible insights into how to build a business with our listeners here and I can tell just personally, I’ve kind of been like your biggest cheerleader on this podcast but I can say, honestly, I can’t do a podcast now without a Mizzen+Main shirt on. On doing an interview, it does sometimes feel a little bit like an athletic feat with the amount that I sweat every time. So, on a serious note, I just want to say thanks for putting a product out there that is incredible and it’s doing good things for people in financial services besides just professional athletes as well so thank you. [01:10:22] Kevin: That’s awesome. Thank you. Appreciate it. And, again, we’re happy to partner with you on this and American Dream U so if anyone is listening goes to our website, if you enter AmericanDreamU as a code at checkout, we’ll donate $25 to that organization for every purchase. So, thank you guys for supporting that as well. [01:10:39] Brad: So cool of you guys to do. And just as a refresher, I know we talked about it earlier, American Dream U what they do with Advisors Excel, my company, has partnered with them and they’re taking veterans that are coming back from overseas or serving and they’re helping put programs in place, put them back into the workforce and obviously, I can’t think of a better person than you’d want to hire as far as discipline and work ethic than a veteran. So, very cool what you guys at Mizzen+Main are doing, Kevin, to support that so I appreciate it, man. [01:11:07] Kevin: Loved to. Thanks for the opportunity.